Autumn leaves and Don Felder! Can the Great Pumpkin be far behind, Charlie Brown? Hallelujah for Johnnie Frierson, that was awesome. Good Morning my little garbage babies! And a good garbage morning to you fine sir! I missed Oscillations? I'm canceling Tuesday. Just 88 more garbage days until Christmas! HEY. Joe Bethancourt played my (extravagantly pagan) wedding. Diamond bloke. it was joe with a celtic/bluegrass trio. Rocked. What if it were garbage day everyday? I hope you brought your fresh fruit and whole-grain savory snacks, Matt. My beanbag chair got worn out and mom threw it in the GARBAGE! "That's not spaghetti, you ignoramus. It's linguini." "Oh yea?" CRASH! "Now, it's GARBAGE TIME!" Blue skies over the isthmus today, though clouds are in the offing. Did you hear about Hanson from Dungen by any chance? I smell the garbage. Hello Tuesday. I put the trash out every Tuesday. Literally. lol. thedunkel, I just want to know who stepped on the butterfly in the dino-hunting simulator so I can go back in time and kill them. Because that's the only thing that explains this year. Good sounds for a rainy day. @Cecile: Oh no no no, you have absolutely NO idea how much WORSE things would have been had the butterfly not been stepped on in Colorado by Ray's friend on November 5, 68,235,242 BC. This year is a mere goofy comedy of errors compared to the nightmare it would have been had that butterfly made it to the cycad grove to breed. Trust me. I will have to trust you, P-90. I have no choice. Lots of cool synth stuff on WFMU lately. Nice show Matt! @Matt ww: In the spirit of the debates, I am going to repeatedly insist that every song you play is wrong. Alright! Dow Jones. Just thinking about them yesterday. @Greg ALL SONGS ARE WRONG. VOTE GARBAGE! I notice on NPR they pronounce it as "industrals," dropping the "i." Today's Felder Time Snack is gently rewarmed chicken breasts from Dinosaur BBQ in Harlem, USA, with smoky "Wango Tango" habanero barbecue sauce and sides of cole slaw, orzo pasta salad, and sauteed kale. Beverages are a spicy Black River Malbec from Argentina, and Raspberry Daiquiris made with frozen black and red raspberrys, ice, and this amazingly smooth Svedka vodka I've been auditioning recently. you gotta WANGO TANGO BABEH! Spicy black river malbec... YOW! Family Vineyard is Bruce from MX-80's label, I think. I just picked up that Dow Jones record. It's great. hiding in the station? does Matt W also double as security at WFMU? Wherever there is garbage... he is there. "... something something ... WFMU dot ORRRGGG! !! !!!" love those accenting bongos in random parts of the song.......as if the mix session was just so exhausting Don was just like "hell leave 'em in..." maybe its not bongos....some sort of off kilter percussion that does not belong in there. Don. franny -there are lots of things in there that don't belong in there! ...so many that they ALL belong in there. the greatest song about Scrabble ever. @coelcanth. you're right about that. Nots will see me off to el trabajo. See ya! Jeezus. I'll never walk away from the headphones again, iff'n you gonna pull this kind of move. 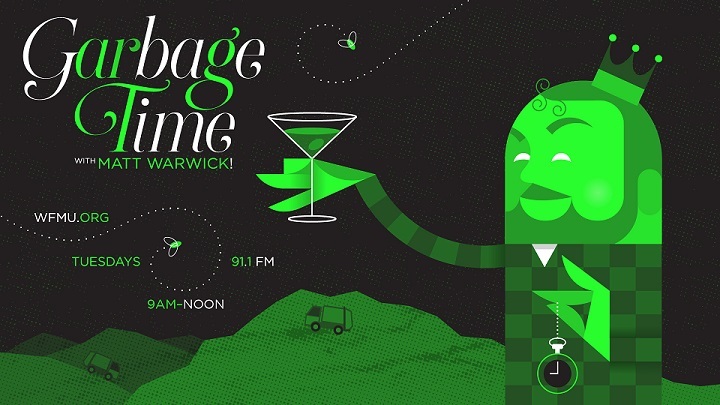 OK, @DJ Matt ww, I'm pretty sold on this idea that Garbage Time can be as relevant, provocative, and enriching in the late morning slot as it was in the Wee Wee Hours. Helluva thing. This song makes my orgones itch. Anyone else? @P-90 It makes shungite tremble. Did amEdeo take control right there? SHOUT OUT to amEdeo on The Left Coast! The taco truck is about 18 feet from the building entrance. I hope I can make it that far. Hee hee, this playlist is making me giddy. wow, i've not heard this Focus song in like, 45yrs??? The locus of Focus puts a Hocus Pocus on my tookus. version does sound a bit different. @fred: i'm on 2nd floor, so that makes food-truck surgical strikes much easier. But that was a cosmic fail. I'll never leave again. What a crazy, brilliant song (Focus)!! What ever happened to amEdeo? Did the government silence him? did he finally find the missing Malaysian Air flight 370? I wonder if anyone has given this the pooeyflute treatment yet. Just don't leave out the "Popeye" verse...? Please...? Garbage Time MEANS hidden treasures. For some reason, Hawkwind and that particular Focus song really belong together. @fred - I can't master "Hot Cross Buns," so that would be pretty advanced. But then, such is pooey.